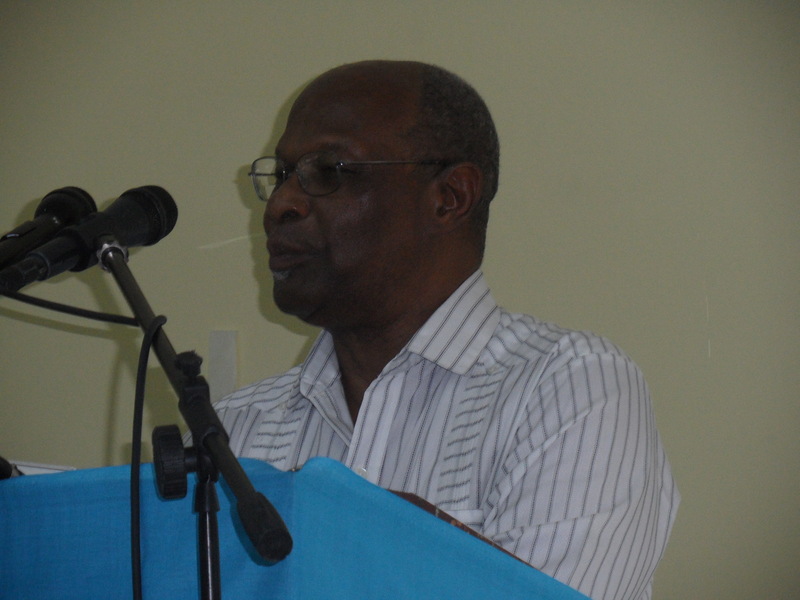 The Chief Executive Officer of the Caribbean Climate Innovation Center (CCIC), Mr Everton Hanson, says the application deadline for the Proof of Concept (POC) Grant Funding Scheme has been extended to April 20, 2014. The CCIC was officially launched on January 27, 2014. 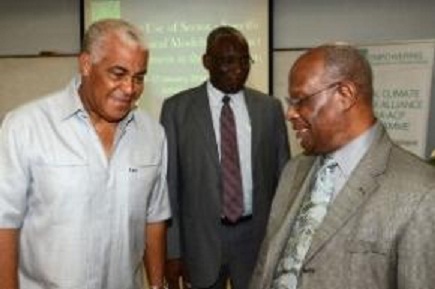 The Center is a World Bank financed Caribbean initiative being executed by a consortium comprising the Caribbean Industrial Research Institute (CARIRI) of Trinidad and Tobago and the Scientific Research Council (SRC) in Jamaica. The CCIC is headquartered in Jamaica and delivers its services in 14 CARICOM countries. These are Antigua and Barbuda, Barbados, Bahamas, Belize, Dominica, Grenada, Guyana, Jamaica, Montserrat, St.Kitts and Nevis, St. Lucia, St. Vincent and the Grenadines, Suriname and Trinidad and Tobago. 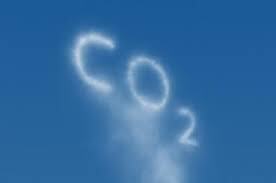 The main objective of the CCIC is to support Caribbean entrepreneurs in developing appropriate technologies suitable for the mitigation or adaptation to climate change. This is expected to be achieved through the offering of services such as, among other things, technology commercialization, market development, and access to financing, mentoring and training, incubation and CAD Lab services to such entrepreneurs. 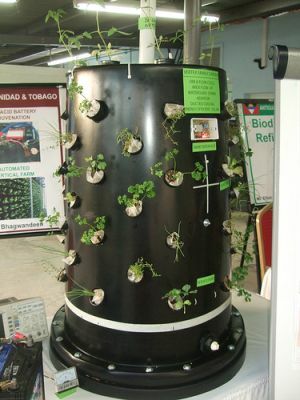 Industrial engineer Ancel Bhagwandeen says growing your food indoor is a great way to protect crops from the stresses of climate change. So he developed a hydroponic system that “leverages the nanoclimates in houses so that the house effectively protects the produce the same way it protects us,” he says. chairs the CCIC's Management Committee. The Caribbean CCIC is one of eight being developed across the world. The Food and Agriculture Organisation (FAO) and the Global Water Partnership-Caribbean are still seeking consultants to update the FAO’s AQUASTAT Report for the Caribbean. The deadline date for proposals for Cuba, Dominican Republic and Jamaica only, has been extended to March 5th, 2014. The Food and Agriculture Organisation (FAO) has a unique global water information system, AQUASTAT, developed since 1993 by the Land and Water Division. The main objective of the programme is to systematically select the most reliable information on hydrological resources and water use in each country, as well as to make this information available in a standard format for interested global, regional and national users. Interested persons should submit their proposals for Cuba, Dominican Republic and Jamaica only via email to info@gwp-caribbean.org and address to the GWP-C Regional Coordinator. Download the Terms of Reference for the various consultancies here. 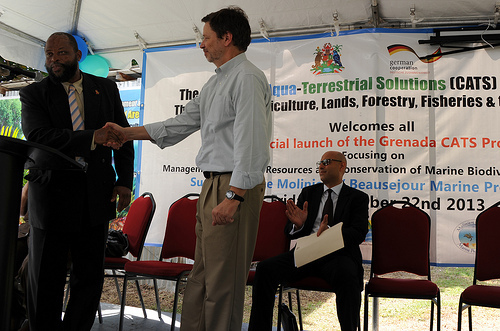 Grenada’s Ministry of Agriculture, Lands, Forestry, Fisheries & Environment launched the Caribbean Aqua–Terrestrial Solutions (CATS) programme last week (November 22, 2013). The launch featured the official handing over of various equipment by the German Ambassador Stefan Schlüter to the Hon. Roland Bhola, Minister of Agriculture, Lands, Forestry, Fisheries & Environment, a highly informative and lively presentation by MPA Coordinator Roland Baldeo on the work of the Molinière-Beauséjour Marine Protected Area (MPA), and the opening of the new MPA administrative office. There was also a lionfish information display, featuring live lionfish aquarium and delicious lionfish tasting! CATS is an umbrella program that follows a ‘Ridge-to-Reef Approach’ by bringing together two topical projects, namely one on “Adaptation of Rural Economies and Natural Resources to Climate Change”, and the other on the “Management of Coastal Resources and Conservation of Marine Biodiversity”. In the case of CATS, the ‘Concept of Herding CATS’ has been adopted, which will aid the region to effectively coordinate the support provided by various International Development Partners (IDP) and Non-Governmental Organisations (NGO). CATS is a regional development cooperation program between the Caribbean Community and Common Market (CARICOM) and the Government of the Federal Republic of Germany. The implementing agencies are the Environmental Health and Management Unit of the Caribbean Public Health Agency (CARPHA) and the German Government’s Agency for International Cooperation (GIZ). The program will soon operate in eight CARICOM Member States from Guyana, Grenada, St. Vincent & Grenadines, St. Lucia, Dominica, St. Kitts & Nevis, Jamaica and Belize.